A magnificent day for NVH on the south coast. Two reports have been written for this one, so here are both of them. Results can be downloaded here. A magnificent day for NVH on the south coast. Two reports have been written for this one, so here are both of them. Leaving Peterborough at 7:30 on Saturday confidence was not at its best, we were short in numerous events and heading down south for a tough fixture. Brighton were last year's champions and Tonbridge were one place behind but on equal points. We had Ray and Brenda Church, Mick Lynas, Alex Wray and Andrea Chapman lined up for officiating and travelling down specially for that purpose - winning points by doing so. On the ladies side we only had one athlete noted as a middle or endurance runner and several key athletes missing form the men's team but by the time we had arrived we had numerous volunteers to the extent of suggesting that some did not compete in the extra events due to the rules and safety for the athlete. The team pulled together well and the support for their fellow competitors was second to none. All in all these athletes deserve the plaudits of achieving a match win in this fixture which moves them into second place in the league. The next fixture on 4 July 2015 is our home match but pitches us up against Crawley who are top of the league and Bedford who were second before Saturdays performance. On the day, Ellie Mae Stokes was the only club record breaker but many others produced personal best and season best performances, a credit to the whole teams effort. Ellie Mae threw her javelin 35.65m to establish a new under 20 and senior club javelin record. The day started unbelievably, Rosie Jacobs, Anne-Marie Sayle, Ben Jones and David Bush dropping just one point in the 400m hurdles first event followed by wins in the field for Andrea Jenkins and Kelly Lawrence (Hammer), Emma Hornsby and Emily Maltby (long jump) and Rosie Fresen (pole vault) with Rosie Jacobs deciding at the last minute to go and vault herself into second place. The men were also winning in the field with Martin Tinkler and Simon Achurch both winning in the shot putt. Half an hour into the contest and the team managers could not believe what was being achieved. The day continued in the same manner with many brilliant efforts being rewarded with the relevant points. Top scorer on the day was Emily Maltbys 16 - 4 wins with a further point in the relay. 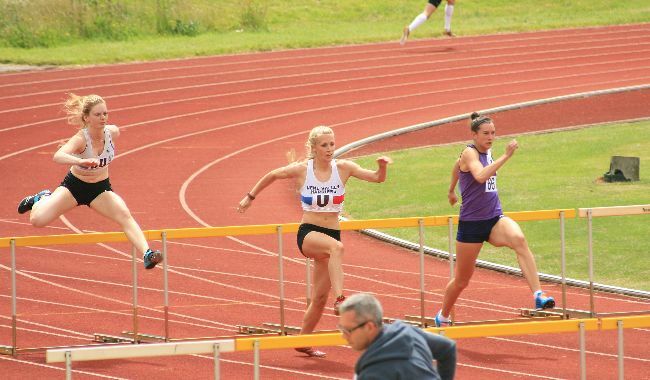 Rosie Jacobs was not far behind with 13 points being wins in both hurdle events and a third in the 1,500m before her second leg run in the relay helping the ladies to a second place in the 4x400m. 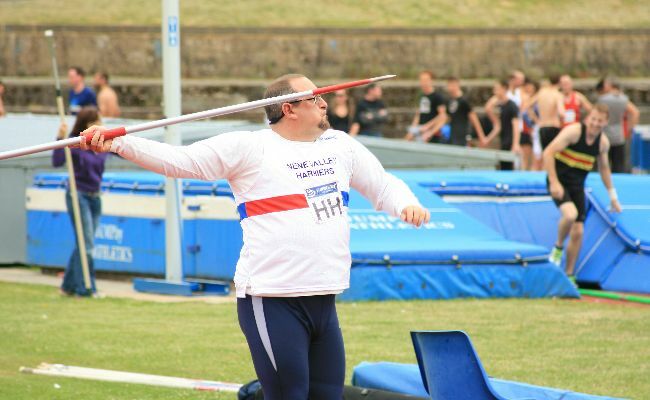 On the men's side Simon Achurch threw everything that had not been fastened down attaining 14 points with two wins and two second places, ably assisted by two wins from Martin Tinkler in the shot and discus. Jake Berney had four tough individual competitions but still scored double points and David Bush competing in less events than normal still attaining double points along with a great personal best javelin throw of 44.35m. I have reserved a special mention for Jevan Robertson who ran both the 5,000m and the 2,000m steeplechase; Rosie Jacobs running a 1,500m and vaulting over the bar in the pole vault; Cat Foley for running a 3,000m despite being the main athlete for the club in the 800m and 1,500m; Anne-Marie Sayle for running not only the 400m hurdles but the 2,000m steeplechase joining Rosie Fresen in that event and waiting for each other after the water jump on each lap. These athletes were not forced to do these events but had requested to do so in order to assist the team and were well cheered on by their teammates. The field officials for NVH summed up the clubs attitude towards the sport by allowing two athletes to compete right at the end of the competition after they had left for another event due to problems with the Brighton runway. Bearing in mind the club came second in the first fixture by an odd point, they felt it only fair to allow the athletes to compete for the home club in this event as they had been there whilst they tried to sort the board problem. The action was appreciated by the field referee and Brighton team manager. Although it is not sure whether Tim Needham stuck to his promise of ice cream if we won this match the motivation was clear to see and the overall team spirit on this long trip does leave a warm feeling. Well done to all involved and we look forward to continuing at Peterborough. Nene Valley Harriers track and field team delivered a rock solid performance at Brighton on Saturday, winning their Southern Athletics League clash against host club Brighton and Hove AC, Tonbridge AC and Walton AC. The Harriers got the day off to a flying start only dropping one point in the opening track event, the 400 metres hurdles. Rosie Jacobs and Anne-Marie Sale won the ladies A and B races, whilst Ben Jones was runner up in the men's A race with Dave Bush going one better in the B race. 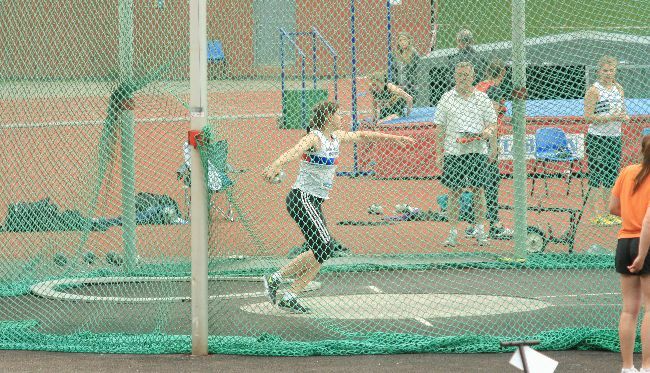 The fine start to proceedings on the track was echoed in the field events, with wins for Andrea Jenkins who threw 48.88 metres and Kelly Lawrence in the hammer, along with Emma Hornsby and Emily Maltby in the long jump. It wasn't just the ladies who were enjoying a field day, with Martin Tinkler and veteran Simon Achurch claiming maximum points in the shot putt. The pair of ace throwers repeated this feat later in the day in the discus. Having moved into a big early lead over their three opponents it became clear that victory was a distinct possibly for a Harriers team already holding down 3rd place in the sixteen club League. The good work continued, with consistent scoring across the team, and a number of outstanding individual displays. Perhaps the most eye catching of these came from Ellie May Stokes who threw her javelin 35.65 metres. This mighty throw not only gave the 17 year old the under 20 Nene Valley club record, but the senior record as well. rated jumper and sprinter also won the B high jump and long jump competitions. 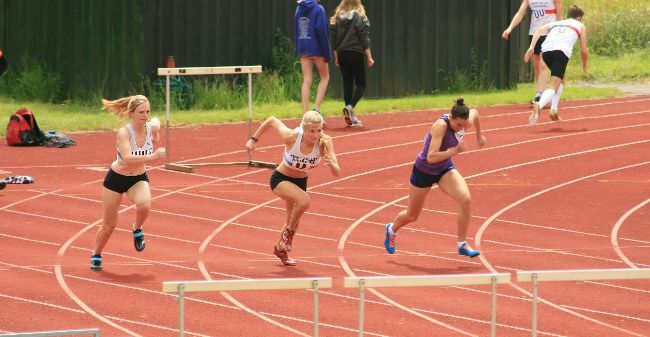 In form Cat Foley won both the 800 metres and 1500 metres, and other firsts were recorded by Rosie Jacobs in the B 100 metres hurdles, Emma Hornsby, making a welcome return to competition, added first place in the high jump to her long jump Victory. Meanwhile Lydia Church and Devon Spencer won the B shot putt and triple jump and Rosie Fresen finished first in the pole vault. Andrea Jenkins added to her hammer victory with first place in the B hammer. Jenkins also picked up the woman of the match award. 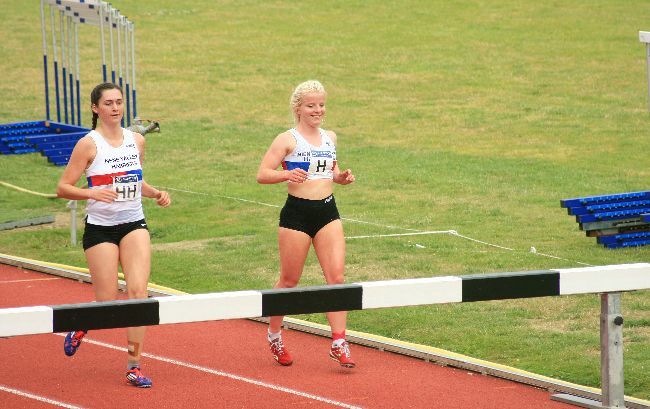 Nene Valley Harriers host their match in the next round of the Southern League, at the Peterborough Athletics Arena on 4 July. What an afternoon of track and field it promises to be, with the the other two contenders for the Southern Athletic League title, Crawley AC and Bedford and County amongst the opposition.